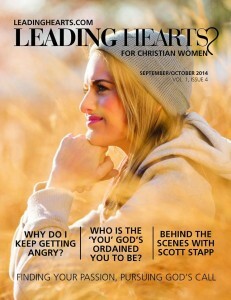 This new issue of Leading Hearts magazine is dedicated to growing Fruits of the Spirit in every season. Are you able to serve up an RDA of Gentleness, Kindness, Patience, Goodness, Self Control…? Is your produce aisle experiencing a shortage When the seasons ebb and flow? Get Insider Tips for Maximizing Your Ministry Potential! 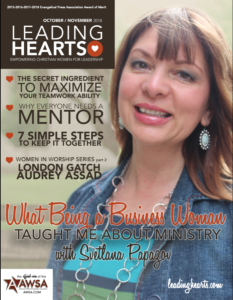 For this issue of Leading Hearts, we take an in-depth look at Ministry in the Marketplace. Features include a business woman’s insight on ministry from Svetlana Papazov; why leaders need mentors with Jayme Hull (jaymeleehull.com) , secrets to maximizing your ability to be a team player (linkedpersonalities.com), Torry Martin’s Call of the Mild as well as the second installment of our women in worship series with London Gatch and Audrey Assad. You’ll find that and much more in the new issue. Text LEADINGHEARTS to 64600 to have this issue delivered. Available to download as a printable click HERE. It is available NOW on your PC, click HERE or just click on the cover. How Bold Women Survive Character Assassination, Ministering through Depression and Nurturing Your Women’s Ministry. In the special edition of Leading Hearts dedicated to Women’s Ministry, we take a look at what it means to be a woman traversing the mountains and trenches of church leadership. 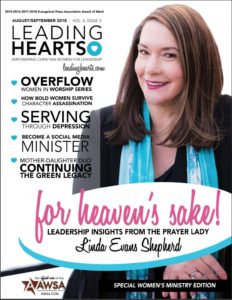 This edition features interviews with: the prayer lady, Linda Evans Shepherd (publisher of Leading Hearts and Founder of Right to the Heart Ministries); Jackie Green (co-founder of the Museum of the Bible and wife of Hobby Lobby president Steve Green) and daughter Lauren, Planetshakers Pastor Sam Evans and local church worship arts pastor Michelah Weaver. We did it again with our 5th EPA Merit Award! 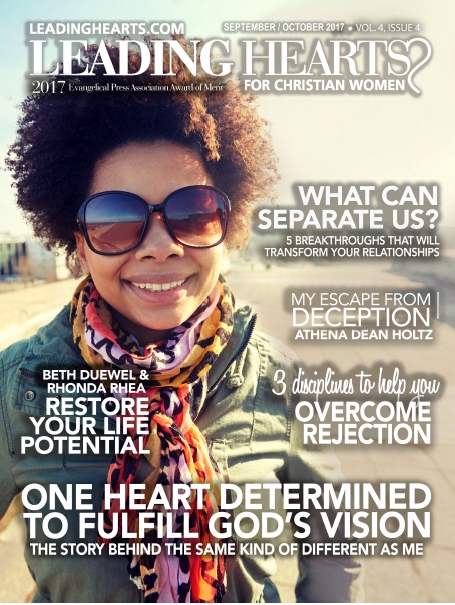 This issue features interviews with author Sophia Ruffin, author Sheryl Giesbrecht Turner, musician Anne Moses of the Anne Moses Band, and Andrew Hyatt, writer and director of the box office sensation, “Paul the Apostle of Christ.” And so much more! You’ll find that and much more in the new issue. Text LEADINGHEARTS to 64600 to have this issue delivered. Available to download as a printable click HERE. Join Leading Hearts as we celebrate five years of excellence in publishing. 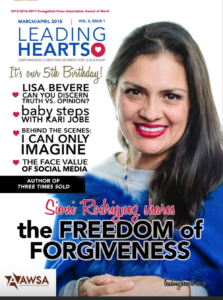 This issue features interviews with author Sioni Rodriguez, best-selling author Lisa Bevere, singer-songwriter Kari Jobe, and Andy Erwin, co-producer of the box office hit, “I Can Only Imagine.” And so much more! Available to download as a printable PDF, click HERE. We are kicking off 2018 with a question: Do you struggle in the business of ministry to build God-centered purpose instead of notoriety-building platforms? 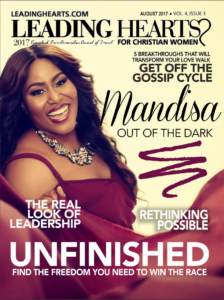 This issue is dedicated to helping you find confidence as well as rise up and embrace His purpose, being true to the audience of ONE for such a time as this. 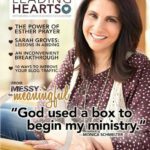 Our cover girl — author, speaker and “Bridges” Talk Show host Monica Schmelter (monicaschmelter.com) — shares her Messy to Meaningful ministry beginnings that started with a box dedicated to prayer. 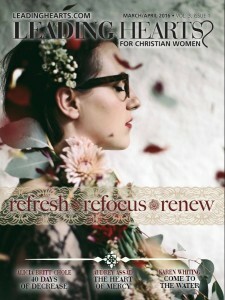 Find out about the launch of our new Arise DAILY (arisedaily.com) e-devotionals and get in on the month of giveaways. Hear the story of Holt International spokesperson Ashley Schroder, singer/songwriter Sara Groves’ lessons in abiding, and Saundra Dalton-Smith’s tips for breaking through an attitude of being inconvenienced. We’re just a few days away from Thanksgiving and the biggest Christmas shopping day of the year, so who better to help us ring in the LAUGHTER and capture the JOY of the holiday season than Chewbacca Mom Candace Payne? It’s amazing how God took her 4-minute viral video of her laughing and turned it into a platform to share the love of Jesus Christ. 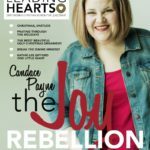 For this issue of Leading Hearts, we’d like to help engage you in a movement—A Joy Rebellion. No matter what frustrations and stress our daily lives serve up, how can we serve up joy in the middle of it? Get insights for celebrating Christmas, unstuck from Pat Layton and enter your story to win a $100 gift card. Veggie Tales own Leslie Farrel, Recapturing the Laughter in your Marriage with Pam Farrel, insights from Kathi Lee Gifford’s journey to Israel, and highlights from the A Question of Faith movie. You’ll find that and much more in the new issue. 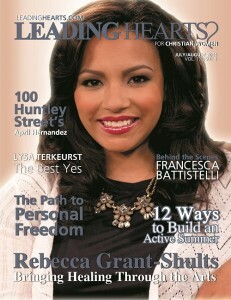 Text LEADINGHEARTS to 64600 to have this issue delivered free to your mobile device. What is separating you from living out the fullness of God’s best for your life and ministry? Is it feelings of inadequacy, fear, prejudice, bitterness, exhaustion or defeat? 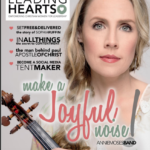 In this issue of Leading Hearts you’ll hear singer/songwriter Natasha Owens’ journey to overcome the unexpected loss of her father and Athena Dean Holtz’s Full Circle testimony that brought her out Scientology and a cult to embrace His true restoration. We also have an exclusive interview with Ron Hall, the bestselling author whose personal story of compassion for the homeless, The Same Kind of Different as Me, is now in movie theaters. There is so much more packed into these 52-pages, you’ll want to be sure to pour a big cup of joe and check it out . 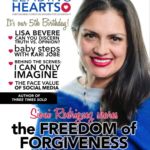 To get this issue delivered straight to your mobile device, text LEADINGHEARTS to 64600. Isn’t it time you’d embraced all the freedom available to you in Christ Jesus?! 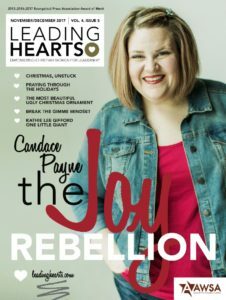 This issue of Leading Hearts which is a celebration of breaking through stigmas, hang-ups and leadership stereotypes. 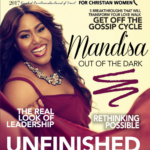 You’ll read Mandisa’s personal story of overcoming depression that almost led her to take her own life, tips for getting off the gossip cycle, Karen Porter’s tips for leadership success, Valerie Wieners bible art journaling how-tos (use the password free to unlock this special embedded tutorial) and more packed into 52-pages.and more packed into 52-pages. 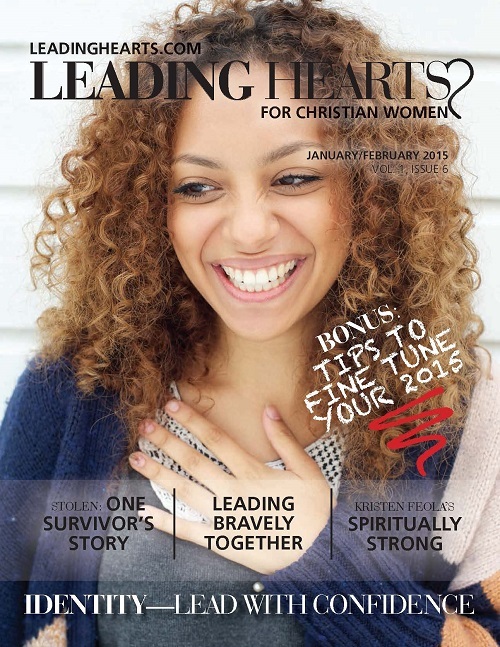 To get this issue delivered straight to your mobile device, text LEADINGHEARTS to 64600 . The May June Life in High Definition is here! 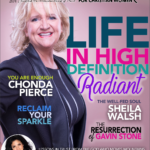 In this issue we talk about how you can reclaim your sparkle and be the best radiant you to date. 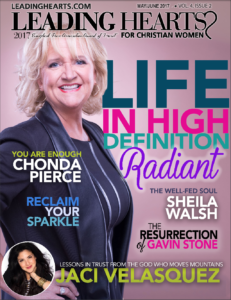 Join Chonda Pierce as she coaches us to understand, that in Christ, we really are enough. Read the latest insights from Jaci Velasquez and take a peek at Shelia Walsh’s ideas on how you can have a well fed soul. 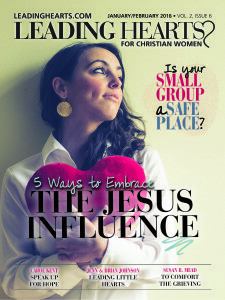 To get this issue delivered straight to your cell phone text LEADINGHEARTS to 64600 . It is available NOW on your PC, click HERE or just click on the image below. 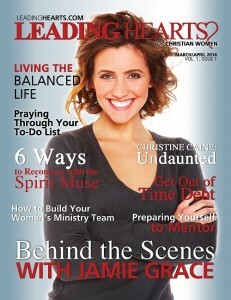 To get this issue delivered straight to your cell phone text LEADINGHEARTS to 95577. Just in time for St. Patty’s Day, Leading Hearts is giving you a Pinch to GROW ON! Is God challenging you to to move forward in faith in your life and ministry? Do you feel stuck? Are you feeling scared about the road ahead. Get inspiration from Liz Curtis Higgs, Poppy Smith, Pam Farrell and New York Times Best-seller Tosca Lee. Darlene Zschech also shares her new season of wellness as a cancer survivor. 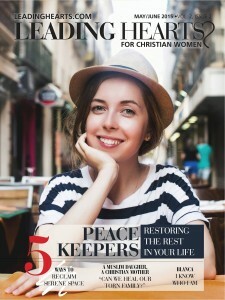 To get this issue delivered straight to your cell phone text LEADINGHEARTS to 64600 . When God created Adam and Eve, He created the first generation of STORYTELLERS. He designed this duo with the heart to play the lead role in shaping the story of their lives and for this legacy to be passed down from generation to generation. That’s why He has given you and I a unique STORY of God’s love and faithfulness that demands an audience. 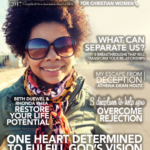 This issue is packed with inspiration, insight, and encouragement for you to step into the role of the Storyteller God’s created you to be! 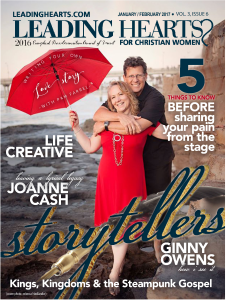 You’ll read stories from the sister of the Man-in-Black legend Joanne Cash as well as music artist Ginny Owens, and hear Pam Farrel’s heart on writing your own “real life” love story. We also have practical tips and personal insights for building and sharing your story—from the pen to the platform and even the silver screen. 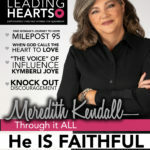 To get this issue delivered straight to your cell phone text LEADINGHEARTS to 64600 . 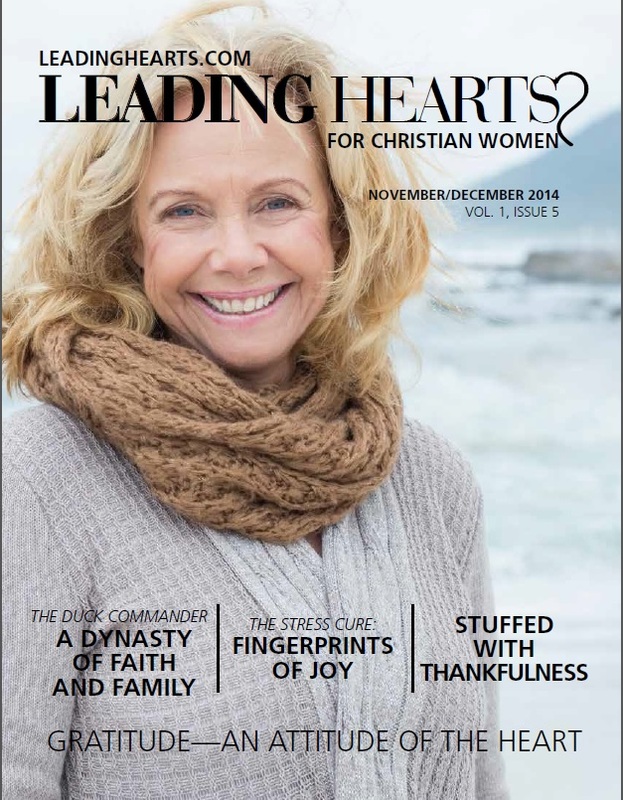 We’re taking time to celebrate the seasons in this special holiday issue of Leading Hearts. But seasons don’t always come with a celebration of turkey and tinsel. 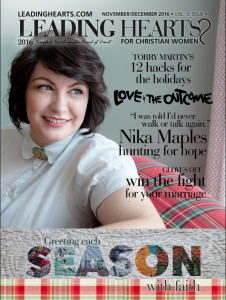 Besides the best holiday tree-trimming tutorial and exclusives from our own funny man Torry Martin, you’ll find stories of women who, by Facing Each Season with Faith, have weathered whatever storm has come their way. You’ll find a Leading Hearts exclusive feature of “I Am Not Ashamed” that includes an interview with the mother of Rachel Scott, one of the students killed in the Columbine High School shooting. 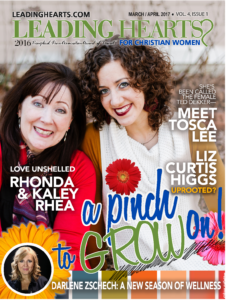 You will also enjoy season-filled articles featuring Love and the Outcome, Nika Maple’s miracle story, how God helped Greg and Julie win the fight for their marriage, Lee Ann Mancini’s journey to children’s book authorship and much, much more. 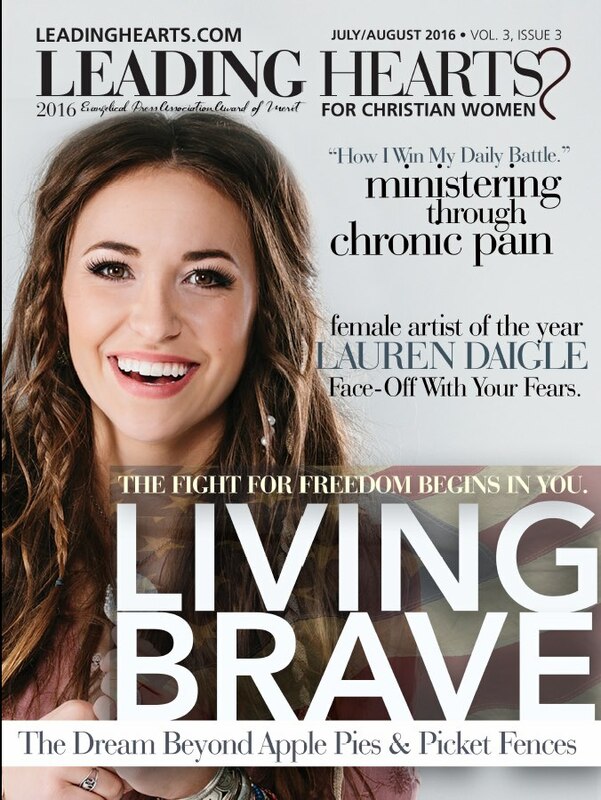 This issue of the magazine is dedicated to encouraging you to step up and LIVE BRAVE for his Glory. 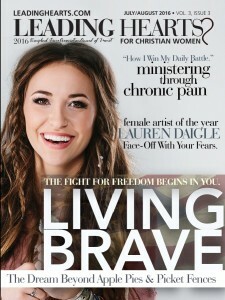 Our sisters Lauren Daigle, Jo Ann Fore, Karen Porter, Maureen Pratt and many, many more will challenge you to throw away the stereotypes, stigmas and your negative mind space to step into who you were divinely created to be as a one-of-a-kind, uniquely gifted and empowered daughter of the King…and that is something that deserves celebratory fireworks. LET FREEDOM RING! 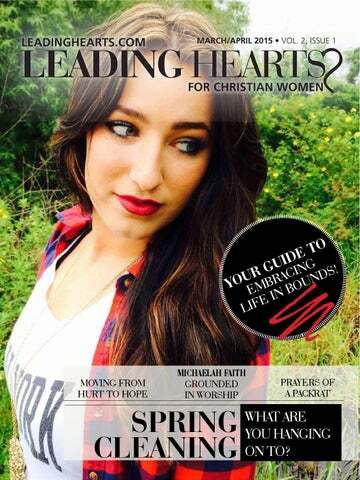 To get this issue delivered straight to your cell phone text LEADINGHEARTS to 64600. It is available NOW on your PC, click HERE. 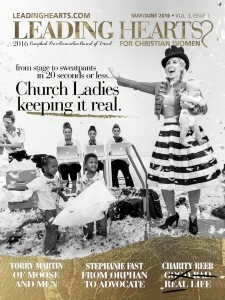 We’re celebrating the sparkle of our award-winning magazine by celebrating you—#REALCHURCHLADIES. 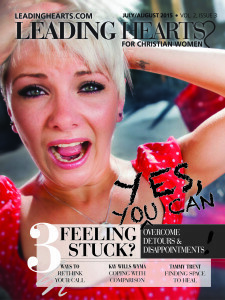 In this issue you’ll meet girls just like you and me—one sisterhood, united in God purpose, to keep it real for His Glory.Get the best of advice from #realchurchladies like Charity Reeb, Karen Porter, Pam Farrel and Stephanie Fast and 1GN (One Girl Nation) who know first hand that God uses lots of grit to shine through His diamonds a.k.a. His daughters. All that and more is packed into the new issue. Get mobile delivery of this issue by texting LEADINGHEARTS (one word) to 64600 to access special leadership support tools and freebies. Available to download as a printable PDF, click HERE. Click HERE to read on your computer. The March/April 2016 Issue is here! 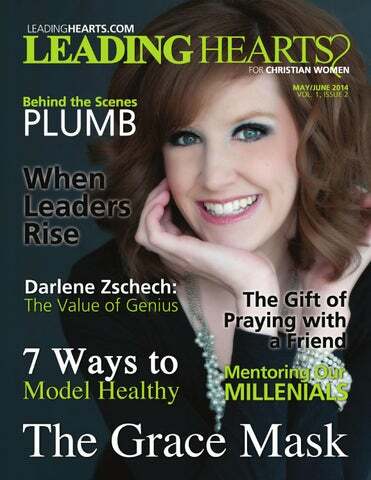 The March/April issue of Leading Hearts encourages you to REFRESH, REFOCUS AND RENEW in your leadership journey. 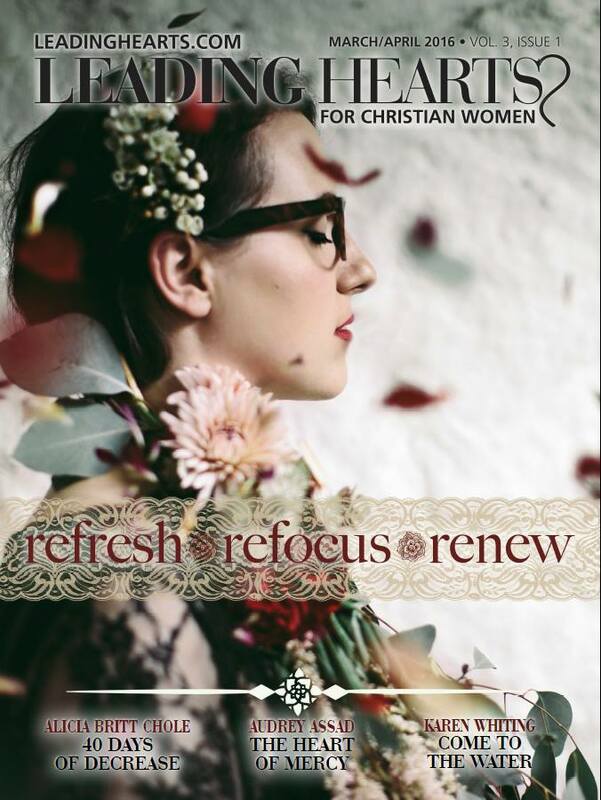 Dive into this issue to get a fresh perspective on life and tips for you ministry from Alicia Britt Chole, Karen Porter, Beth Duevall, Kinda Wilson and Church Planter Svetlana Papazov. All that and more is packed into the new issue. 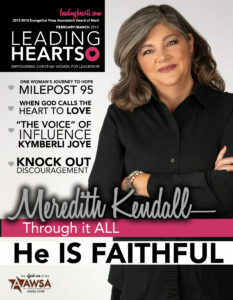 Get mobile delivery of this issue by texting LEADINGHEARTS (one word) to 64600 to access special leadership support tools and freebies. The January/February 2016 Issue is here! 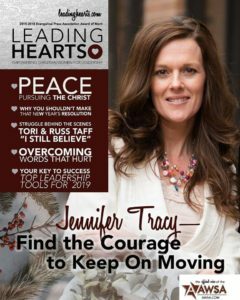 This issue of Leading Hearts is dedicated to developing the Jesus Influence in your leadership style, moved by loved, compassion and rooted in a humble desire to serve. Find inspiring articles by Julie Gorman, Carol Kent, Karen Porter and Susan Mead. Get self-publishing and professional development tips from the experts. 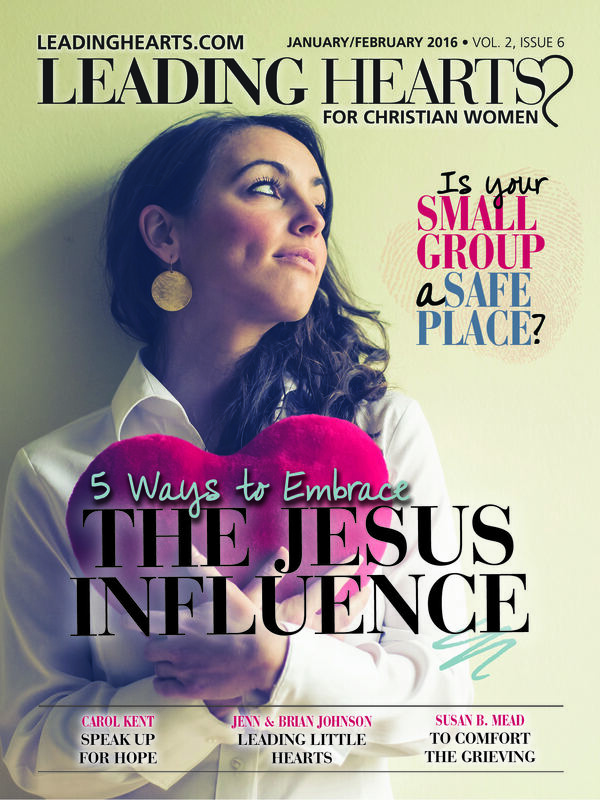 You’ll also find tips to create a safe place for members of your small group, music to listen to, books to read and so much more all packed into this issue! TheJanuary/February 2016 Issue is FREE and is in the Apple Newstand. Click HERE. And soon available to download as a printable PDF, Click HERE. The November/December 2015 Issue is here! Do you need to breakthrough the noise of the season filled with parties and packages to receive fresh insight for your life or ministry? Are you struggling for your prayers to be heard? 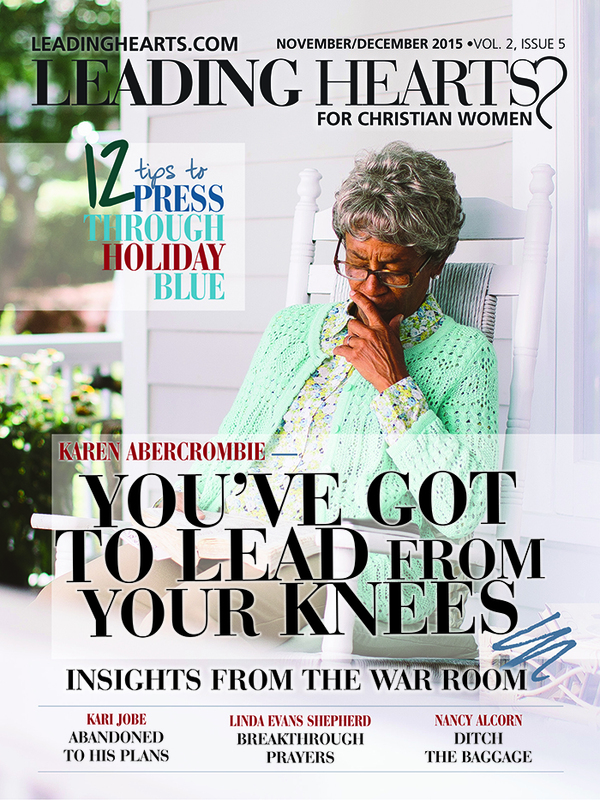 This issue is dedicated to harnessing the power of “War Room” prayer, with special insight from actress Karen Abercrombie and best-selling prayer author Linda Evans Shepherd. You’ll also get Spirit-building perspective from Kari Jobe, Nancy Alcorn, Pam Farrel and Stress-Handling Expert Dr. Pete Sulack. All that and more is packed into the new issue. 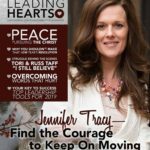 Get mobile delivery of this issue by texting LEADINGHEARTS (one word) to 64600 to access special leadership support tools and freebies. The November/December 2015 issue is FREE and is in the Apple Newstand. Click HERE. And now available to download as a printable PDF, Click HERE. The September/October 2015 Issue is here! Do you struggle with juggling the demands of your day? Are you fighting to find sacred quiet space. In this issue of LH you’ll get great tips on living life with boundaries and reconnecting with what matters most. 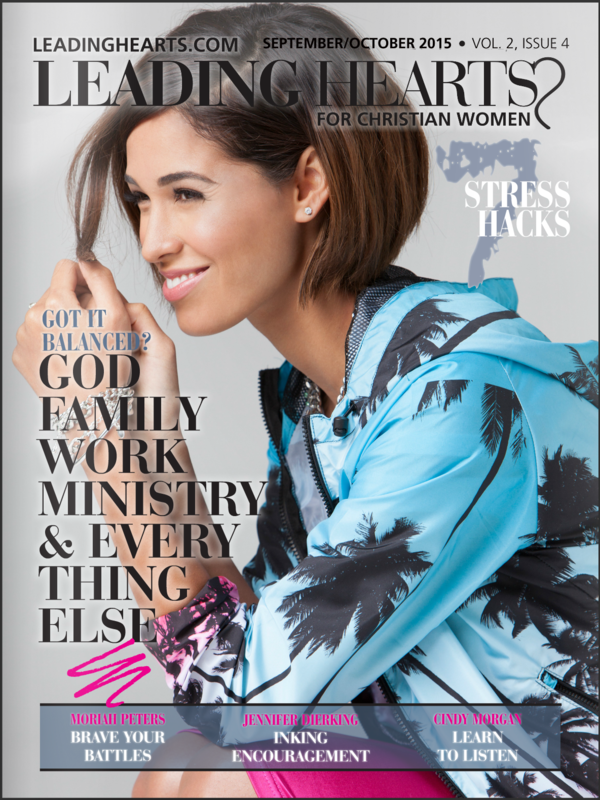 Issue includes insights from Moriah Peters, Cindy Morgan, Julie Gorman, Dr. Gail Hayes and Stress-Handling Expert Dr. Pete Sulack. All that and more is packed into the new issue. Get mobile delivery of this issue by texting LEADINGHEARTS (one word) to 64600 to access special leadership support tools and freebies. The September/October Issue is FREE in the Apple Newstand. Click HERE. And available to download as a printable PDF, Click HERE. The July/August 2015 Issue is here! Yes, You Can Overcome Ministry Detours and Disappointments! 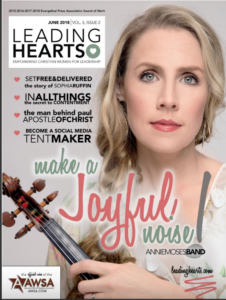 In this issue of LH find features on Walking the Tightrope of Marriage as you follow your ministry call, Embracing changing ministry seasons with Project Rescue co-founder Beth Grant, and the journey to find healing space when the unexpected happens with music artist Tammy Trent. All that and more is packed into the new issue. 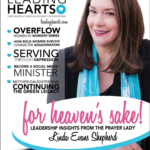 Get mobile delivery of this issue by texting LEADINGHEARTS (one word) to 64600 to access special leadership support tools and freebies. The July/August Issue is FREE in the Apple Newstand. Click HERE. The May/June 2015 Issue is here! In leadership as well as in life sometimes the hardest thing to do is keep your peace. 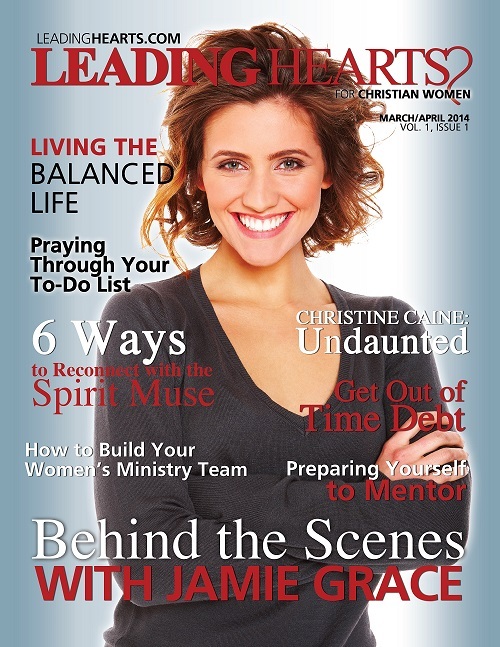 The May/June 2015 issue of Leading Hearts is focused on just that, especially in those moments we are not feeling it. Find articles by Patricia and Alana Raybon, Pam Farrel and Lisa Troyer. Get tips for interviewing and marketing from industry excerpts. Blanca, Ellie Holcomb and the girls of Fireflight also talk to LH about finding peace in the spotlight. All that and more is packed into the new issue. The May/June is FREE in the Apple Newstand. Click HERE. The March/April 2015 Issue has released! 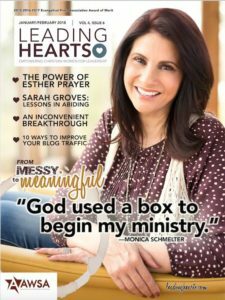 This issue of Leading Hearts is dedicated to the season of Spring Cleaning—our thoughts, our calendars, our relationships and our spiritual lives so we can get in sync with all God that has called us to be. Find articles by Kim Boyce Koreiba, Pam Farrel and Lisa Troyer. Meet Worship Leader and Music Artist Michaelah Faith. The latest music reviews, book reviews, devos and more are all packed into the new issue. The March/April issue is FREE in the Apple Newstand. Click HERE. It is NOW on your PC, click HERE. Now available to download as a printable PDF. Click HERE. The January/February 2015 Issue has released! We are kicking off the new year focused on Identity—Leading with Confidence. Articles include the true story of human trafficking survivor, activist and author Katariina Rosenblatt. Find focus for 2015 with articles by Pam Farrell, Heather Riggleman and Kristen Feola. The latest music reviews, book reviews, devos and more all packed into the new issue. The January/February issue is FREE in the Apple Newstand. Click HERE. The November/December Issue has released! Just in time for the holidays, the Nov/Dec issue of Leading Hearts is focused on Gratitude—The Power of Words. This issue features interviews with Duck Dynasty’s Al Robertson and new Word Records Artists About A Mile. Get set for the season with articles by Torry Martin, Linda Evans Shepherd, Candy Tolbert. Get the latest music reviews, book reviews, devos and more. The November/December 2014 issue is FREE in the Apple Newstand. Click HERE. The September/October Issue has released! 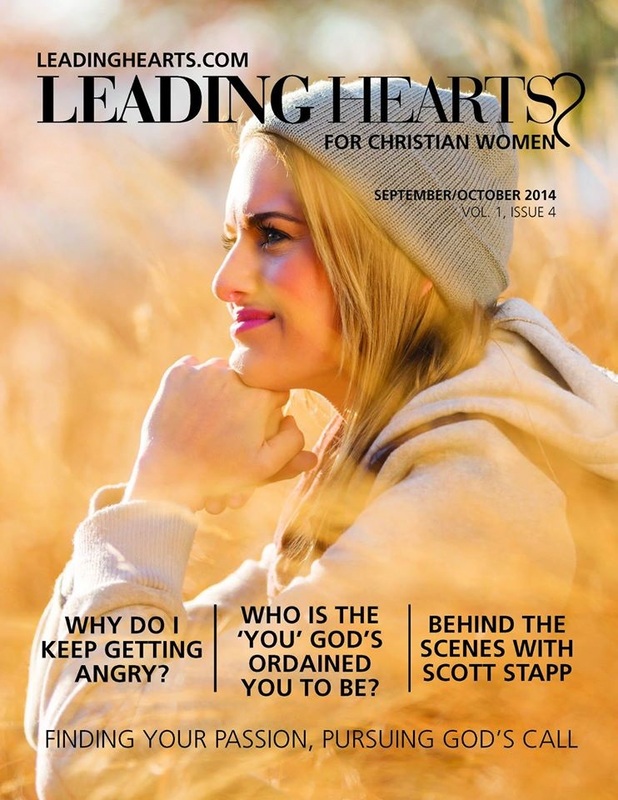 This issue of Leading Hearts is focused on Finding Your Passion, Pursuing God’s Call. Complete with a freshened look for fall you will find interviews with former Creed frontman Scott Stapp, articles by Lisa Troyer, Linda Evans Shepherd, Heather Riggleman. Get the latest music reviews, book reviews, devos and more. The September/October 2014 issue is FREE in the Apple Newstand, click HERE. The July/August Issue has released! This issue of Leading Hearts is focused on the topic of Faith, Family and Freedom. Find interviews with music artist Francesca Battistelli and April Hernandez of 100 Huntley Street as well as articles by Lysa TerKeurst, Lisa Troyer. Music, book reviews and much more—it’s in there. The July/August 2014 issue is FREE in the Apple Newstand, click HERE. The May/June Issue has released! is now on Issuu. CLICK HERE. 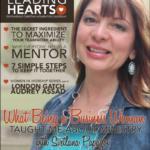 This issue of Leading Hearts is focused on the topic of Mentoring. 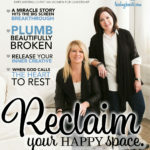 Find interviews with music artist Plumb and Carlos Whittaker as well as articles by Darlene Zschech, Jo Ann Fore, Lisa Troyer. Music, book reviews and much more—it’s in there. To view on ISSUU CLICK HERE. CLICK HERE To view or to subscribe in Apple. The March/April Issue has now released! 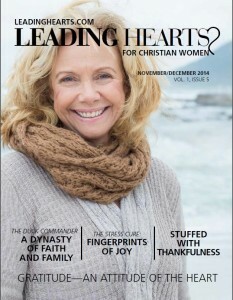 Leading Hearts is not just another Christian woman’s magazine. It is specifically designed with the woman leader in mind, Our mission at Leading Hearts is to help woman be refined in Christ to serve their family, church and community. Read our debut issue.